The Wild Places – the dark untamed forests of wolf and wild boar, the great mountains of ancient eagle and bear, and the unfathomable deep lakes and oceans – were a primal landscape for pre-industrial man. In an animist universe each rock, spring, plant, animal and star has its own powerful rhythm and symbolic resonance. Man is not separated from the creatures and landscape. All living forms interconnect, indeed are created from a common source of energy and matter – this is a profound philosophy that was deeply understood by the ancient Druids. Through the Wild Places, the Celtic Folk-Soul draws her inspiration. I am a stag of seven tines. I am a wide flood, a wind on the deep waters. Who but I knows the secret of the unhewn dolmen. 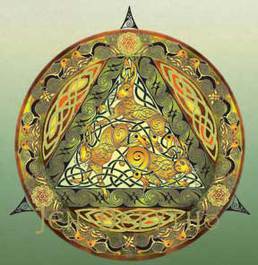 Celtic Poets describe the interconnectedness of nature and the mythic world of belief through personifications that are rooted in a deep, esoteric wisdom tradition. “The Song of Amergin” is one of the oldest, attributed to the ancient Irish Poet Amergin when he first set foot on Ireland. Some say it is an incantation, others a prayer. It is the only surviving poem in colloquial Irish from the Old Goedelic. 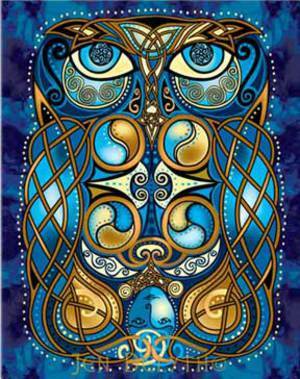 This personal identification with animal, hill, or a wave from the sea, is common among the Celtic poets, and it is this flux between states, the merging of boundaries and forms as revealed through art, poetry and mythology that is so essential to the character of the Folk-Soul. The Poets are highly revered for their insight into the mystical aspects of nature, and are often associated with mythic shaman characters themselves, such as Taliesin and Amergin. Robert Graves’ translation of “The Song of Amergin” arranges the lines in a form that reveals a deep esoteric and mythic meaning: the transformative relationship between Poet and the power and strength of the natural world is both profound and beautiful.